If desserty was a word, the Carolina allspice could be in the dictionary definition. The flowers of the Carolina allspice are demure, but its fragrance isn’t. Even the foliage and bark of this hardy shrub exude the alluring aroma. The Carolina allspice is a southeastern native shrub that provides fabulous fragrance and structure to the flower garden, while asking little in return. You can expect three seasons of interest, including spring through summer blooms and brilliant golden fall foliage, from the Carolina allspice shrub. 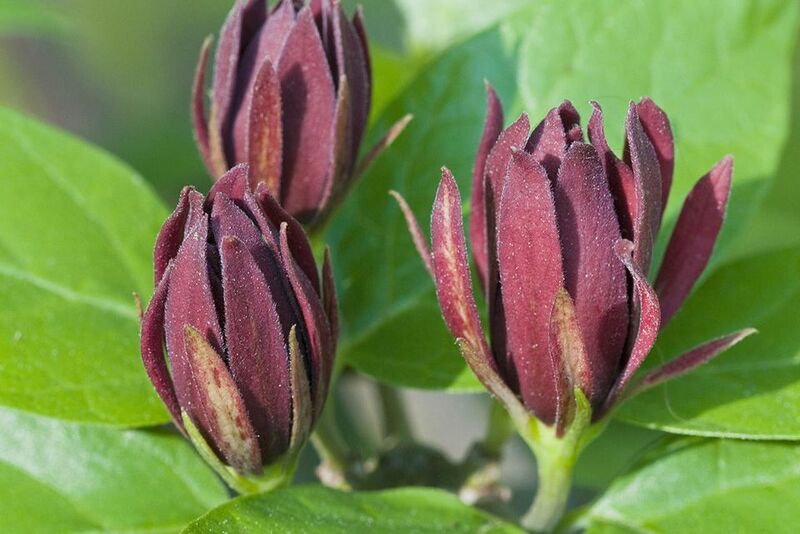 Belonging to the Family Calycanthaceae family and the Calycanthus floridus genus, you might also hear the Carolina allspice referred to by its other common names, including bubby bush, hairy allspice, sweetshrub, or strawberry bush, recognizing its berry-like fragrance. Growing in USDA zones 4 to 9, this native shrub averages 8 feet tall, but grows up to 10 feet tall, spreading generously up to 12 feet. Expect to see the most blooms between late April and early July. At first glance, the flowers of the Carolina allspice resemble magnolia flowers. That’s no coincidence, as the sweetshrub belongs to the same plant class as magnolias. Other fragrant members of the magnoliid class include nutmeg and cinnamon. The Carolina allspice shrub is deciduous, and features elliptical dark green leaves. The blooms are reddish-brown to purplish brown, except in select cultivars like the ‘Athens’ variety, which sports pale yellow blooms in the spring. The blooms are distinctively fragrant, and fragrance can vary from one plant to another. In fact, it's best to buy a plant in bloom, as the occasional rogue plant may be almost odorless or have an off-scent. In general though, many gardeners describe the fragrance of the flowers, leaves, and bark as spicy, some liken the aroma to chocolate, and others are reminded of a fruity, strawberry-like smell. After flowering, your Carolina allspice will develop large seedpods. The seedpods release their fragrance when you crush them, lending an earthy note to potpourri blends. Plant the Carolina allspice in the spring or fall in well-drained soil. Plants will thrive in full or partial sunny conditions. Afternoon shade will help young shrubs cope with hot and dry summers. The shrub will grow in clay soils, but avoid boggy locations. Use raised beds in areas that don't drain well, but provide the shrub with an inch of water per week until it is established, whether that's from rain or irrigation. If you don’t wish this plant to naturalize, you should remove suckers in the spring. Although not invasive, the shrub will gradually spread to form a large colony when left untended. The Carolina allspice tends to have a pleasing, rounded shape as its natural growth habit, but pruning the shrub after flowering can keep it even more tidy and within bounds. The pruning time for the Carolina allspice is late winter, as the shrub blooms on new growth at the tips. Fertilizing with an all-purpose flower fertilizer in the spring is OK, but not necessary each year. You'll get more bang for your buck by spreading compost and chopped leaves around the drip line of the shrub. This will serve to feed the plant, enrich the soil, and reduce water-hogging weeds. Water your shrub deeply in times of drought to encourage a healthy root system. Plant this large shrub in the back of the border, but not so far away that you can’t enjoy the fragrant flowers. Carolina allspice is a nice alternative to evergreen shrubs as a foundation planting. Include Carolina allspice in native wildflower gardens. Plant this fragrant shrub beside your pool or patio, where you can brush its twigs and release its scent. Place the Carolina allspice shrub in areas where deer are problematic, as it is a deer-resistant plant. Although this shrub is too large to plant solely as a cutting garden specimen, if you include it in your landscape you should consider taking a few branches for your floral arrangements. The color, texture, and fragrance of the flowers are desirable additions to your vase. For added variety, grow one each of the unnamed species with maroon flowers and the hybrid cross Venus sweetshrub, which produces white flowers with purple centers. The study in contrast is a delight both in the landscape and in the vase.